Create invoices and get paid fast with QuickBooks. Create an invoice. Get Paid. Relax. Every invoice you create with QuickBooks comes with payment processing built-in. Simply create an invoice and send the invoice to your customer from QuickBooks. Your customer can click on the ‘Pay Now’ button and choose to pay via credit card, free bank transfer, PayPal, Apple Pay, or others. We will process the payment, record the transaction in your books, and automatically transfer the money to your bank account. Creating invoices with QuickBooks means you get instant notifications when your customer views or pays the invoice. Notifications are also sent to your customer reminding them to pay the invoice on time. When an invoice is paid, QuickBooks automatically matches the payment with the invoice in your books for you, saving you time and keeping your books accurate. Creating invoices that represent your business is easy in QuickBooks. You can choose from a variety of invoice templates and then customize the logo, colors, font, and other elements. You can even add discounts, product SKUs, and any other information or details that you’d like to include. Creating invoices doesn’t have to be hard. Do you collect sales tax for the products or services you sell? Let us do the math for you. When creating invoices in QuickBooks, we automatically calculate sales tax by state for you. QuickBooks also keeps track of how much sales tax you accrue and how much you owe. Creating invoices that include billable hours is easy in QuickBooks. Simply track your time in Google Calendar, TSheets, or QuickBooks time tracking and your billable hours can be automatically added to invoices. It’s an easy way to invoice your customers for your time. If you communicate with your customers via text or another messaging app, why not also send invoices that way, too? Once you finish creating invoices in QuickBooks, you can generate an encrypted link that you can text or message to your customer. More than invoicing. Run your entire business with QuickBooks. If you are self-employed and need to track mileage for tax purposes, like Uber and Lyft drivers do, then the automatic GPS tracking in QuickBooks Self-Employed will save you time. Miles are automatically tracked for you, keeping your records up-to-date and accurate for tax time. Easily track your business expenses in QuickBooks. Snap photos of receipts and QuickBooks will add the business expenses to your books for you. Access expense reports to always know how every dollar is spent. Easily reconcile your bank accounts to ensure that the dollars you record match the dollars reported by the bank. When you connect your bank accounts to QuickBooks, we’ll import and organize your transactions for you, making reconciliation fast and easy. See how easy it is to create an invoice in QuickBooks. An invoice is a bill for an account between a buyer and a seller. Invoices aren’t due immediately upon receiving them – instead, they’re used for transactions between vendors and sellers who work with each other on a regular basis. Learn more about invoices and how they’re used here. If you’re having trouble getting invoices paid by your customers, you’re not alone. Read these 6 invoicing tips to make sure you get paid as quickly as possible for your hard work. Invoices are an important communication tool that reinforces your brand and your professionalism. Read why personalizing your online invoices means you’ll get paid faster and you’ll strengthen your relationships with your clients. When I get paid on an invoice in QuickBooks, when will the money be deposited into my bank account? Credit card payments deposit in about 2-3 business days and free ACH bank transfer payments deposit in about 5 business days. For some users, the first payment you receive may take up to 7 days. I see my customers every day. Can I accept a payment on an invoice in-person with my mobile phone? Yes. You can enter credit card info directly into the app, or you can order a mobile card reader to swipe, dip or tap credit and debit cards. Simply tag the payment to your customer and QuickBooks will keep your records updated. Can I send invoices from my Gmail account? Yes. 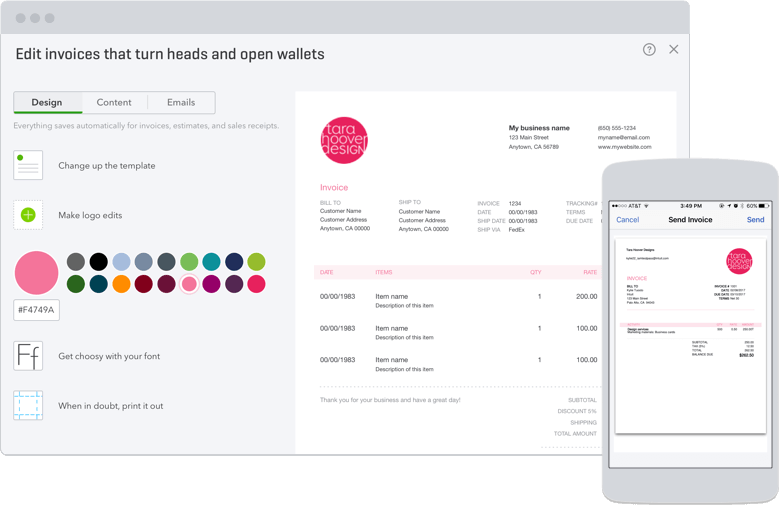 QuickBooks and Google have teamed up to bring you an easy way to invoice customers from your Gmail inbox. ‘QuickBooks Invoicing for Gmail’ is an add-on that is embedded within your Gmail inbox. Once the invoice is created in Gmail, it will sync back to QuickBooks so that your books are always up-to-date. Can I create an invoice for a partial amount? Yes. We call this progress invoicing. With progress invoicing, you can create multiple invoices from an estimate so you can keep track of the progress of a particular job. QuickBooks will automatically remember what portion has or has not been invoiced from the original estimate.